Back in April, a colleague in the Fine Arts department sent a short email whose main body said, roughly, “What’s this I hear about your rocket cups? where can I get a couple?”. Never one to turn away a potential customer, I began to compose a reply in which I planned to insert a link to any of a number of online retailers from whom the commercial rocket cup could be purchased. However, every retailer I checked appeared to be out of stock. I suppose there are two ways to interpret that discovery, one very good and one very bad. Guess which one applies? The Rocket Cup Fleet, featuring a new red porcelain cup flanked by its older brethren. If you’re keen to acquire a 3D printed rocket cup, please visit its page on Shapeways. 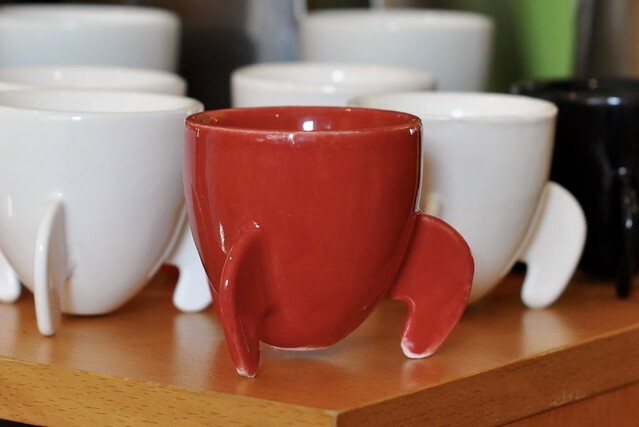 The bad news, of course, is that the 3D printed cup continued to be significantly more expensive than the mass produced version. As always, that’s just the nature of 3D printing—there’s no economy of scale. On the other hand, it’s possible to order the cup in a wide variety of colours, not just white. And I guess there’s still come cachet in using 3D printed household items? My understanding from Lifetime Brands is that the commercial rocket cup is only Mostly Dead, not All Dead. There’s some definite possibility that they’ll reintroduce it under a new brand or as part of a line of “classics” (ha!). So, if you work, say, for the purchasing department of a major department store, please contact them with requests for, oh I don’t know, 100K units.